Great new addition to the Maya and Filippo series. 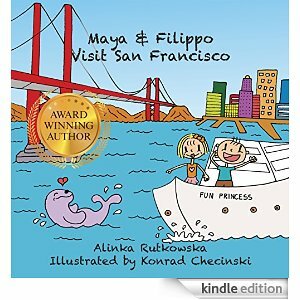 Arriving on a cruise ship, Maya and Filippo set off to explore San Francisco with their mother. Their time is limited, so they try to plan their sightseeing in advance. Mother lists the most famous features of San Francisco for them to consider. Of course, the children have completely different ideas of what would be fun. They try to go to Alcatraz but find all the tickets sold out for that day. A cable car takes them up and down the hills. Their picnic in Yerba Buena Gardens is cut short by rain, a common occurrence in the city. So they have lunch in a café on Union Square. At Fisherman’s Warf and Pier 39, they watch the sea lions play. Feeling bad that they didn’t have time to go to the Golden Gate Bridge, they board the ship and realize the ship will pass directly under the bridge. The illustrations are very colorful and convey the delight of exploring new territory. Second grade readers will increase their literacy skills and comprehension through the adventures. They will learn about the geography and history of San Francisco. The author even includes a quiz to be sure the reader has learned something. Readers will also learns that compromise is a good way to be sure everyone has a great time.